We've made a deposit on an apartment in The Village at The Woodlands Waterway. We liked the cleanliness first of all, the friendliness of the people, and the amenities. The size of the apartment is what we were looking for. We also looked at the food menu. The person who gave the tour was very friendly and very helpful. If I should have to choose between the places I've seen, I would choose The Village at The Woodlands Waterway. I like that it's just within walking distance to the library -- only two blocks -- and it's on the Waterway, which is lovely. It has a beautiful view, and they have the Woodlands Trolley that can take you over to the mall, the theater, and shopping, and it comes by every 15 minutes. There is sheltered parking, but I was told that usually after you've been there a couple of years, you just give up your car, because it's so much easier to use the trolley to go everywhere. It's close to our doctors and very accessible. They do have lectures, it's close to the movie theater, and they do outings on senior days, which is great. They have quite a few activities. The staff was very nice, and we were offered a meal, but we did not go. They have an indoor swimming pool, exercise classes, beautiful verandas, every unit has a balcony, and you can hear the music from the pavilion, which is very nice. I went to The Village at The Woodlands Waterway for respite. The biggest problem is that they consistently don't have enough hot water, and they seem to be unable to fix it because they're using an antiquated system. I heard from other residents that the maintenance seems to be their main issue. Other than that, the staff was good, the food was good, and everything else was fine. Their main advantage is their very nice location. Village at Woodlands Waterway is conveniently located near a lot of good restaurants and shopping destinations. The food is good according to some of the residents. It's a very clean, modern, and new-looking place. The appearance was nice and the grounds seem well-maintained. Also, the staff was very friendly and professional. They have transportation and it seemed very accessible. I know that they also have a lot of activities posted in their events calendar, although I didn't witness any going on. It seems like it would be worth it and what you pay for is what you get. It is an attractive property, in a great location. However, the management and quality of care given residents is very poor. The caregivers and Med Techs in Assisted Living and Memory Care were poorly trained. In Memory Care the ratio of caregiver to residents was 1 to 15. Although promised, there was no "memory care program". The nurse who works only eight hours per day, said The Village is not licensed to have a defibrillator. There were only a few CNAs among the caregivers. The food was tolerable, but not a healthy diet for residents who have high cholesterol, are diabetic, or require any dietary restrictions. The one plus is the transportation amenities. I liked The Village at the Woodlands Waterway. It felt more open and airy. I was very disappointed that the staff member we had an appointment with did not tell me upfront that she had another meeting with a client, but I was really impressed with the person who did tour us. They gave us a little goody bag and thanked us for visiting. The dining room was beautiful. They had transportation for the people. Thank you for providing us with your feedback! We were excited to learn you had such a positive overall experience, and would like to apologize for any confusion on the visit schedule. We would appreciate the opportunity to learn more about your experience, and invite you to reach out to our Executive Director through our community phone number. The Village was very beautiful and looked like a resort. They were very friendly and had an opening for my mother-in-law, so they were really trying to sell the place. They had lots of activities, even more than where she’s living now. In this place, it seemed you could do whatever you could dream of. It was very nice, but you had to have money for that. The staff was very nice and very friendly. As a matter of fact, I just popped in because I emailed them, but they gave me a tour and everything. Wow, this location is perfect! Village at the Woodlands Waterway is absolutely beautiful. When I walked in it felt like I was on vacation at a fabulous resort. This community is peaceful, relaxing, and reminds me of a nice getaway spot. Once inside you are welcomed by relaxing sitting areas and for someone like me who loves to read, this is like heaven. The staff seemed very personable and caring. The food smelled wonderful and tasted just as good. All of the living spaces that I saw were clean, neat, and organized. Thank you for taking the time to comment upon our community. We are delighted that you enjoyed your experience at The Village and will work diligently to retain and improve upon our amenities and services. Our ultimate goal is to provide the best in-class service to our residents. The best way to get to know a community is by scheduling a tour. See the facilities, meet the staff and residents, and get a feel first hand what it's like to live at The Village at The Woodlands Waterway Assisted Living. The Village at The Woodlands Waterway is located just steps away from the beautiful Woodland Lakes, and is convenient to a large variety of superb shopping and dining destinations. Each resident receives a personalized care plan that maximizes independence while still providing the ideal level of service. The Village at the Woodlands Waterway is one of many retirement apartments owned by the Senior Lifestyle Corporation. We pride ourselves on creating senior living communities that enable seniors to live healthy and fulfilling lives, and our Wellness Everyday™ program offered at every community is praised by the International Council on Active Aging. To ensure that our residents enjoy full days packed with activities, we offer a wide range of events including trips and outings, educational opportunities through our Brain Health University programming and live entertainment. A key part of enjoying optimal health is staying physically fit, which is why we provide our residents with access to fitness classes and a regular schedule of supervised programs. Eating well is also an important part of staying healthy. Here at The Village at The Woodlands Waterway, we offer a choice of menu options, all of which are specially created by our chefs to satisfy the range of tastes and preferences of our residents. Healthy snacks are also available throughout the day. Our professional staff are on site 24 hours a day and are happy to assist residents with everything from dressing to bathing to grooming. Residents also never need to worry about chores, as our staff handle weekly housekeeping and the laundering of linens. To make sure that residents receive the very best in assistance and services, each senior is provided with a personally customized package of services to meet their individual needs and preferences. Families also appreciate that we can provide assisted living serivces and memory care, which means their loved ones won't have to leave our community. 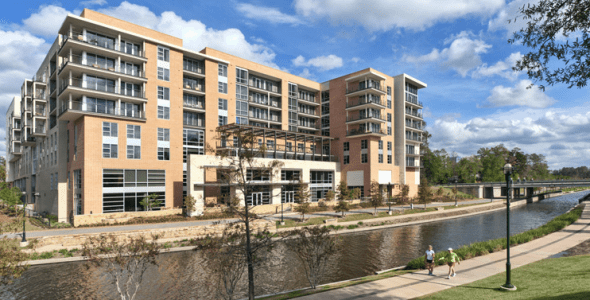 By offering a wealth of amenities and services, The Village at The Woodlands Waterway is an ideal choice for seniors ready to transition into a retirement community.